Celebrate the spirit and community of the South Bronx with storytelling and poetry performances. Write a love note to your neighborhood and share your own Bronx memories and stories in our open mic. The Rhodebeck Community Garden is located at 927 Faile Street at the intersection of Faile, 163rd Street and the Bruckner Expressway, steps from the 6 train at Hunts Point Ave station. 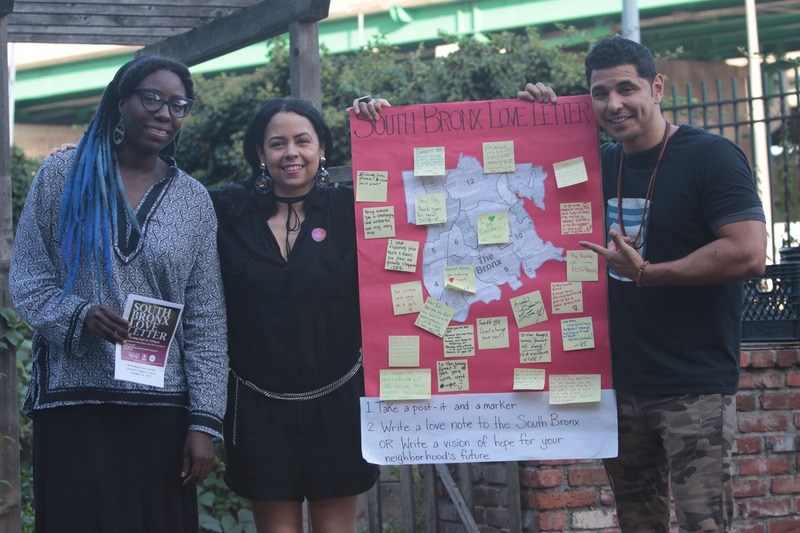 “South Bronx Love Letter” is a series of events and workshops that aim to strengthen connections between neighbors and affirm the stories of people who have been living in the South Bronx, working to make it a better place, and putting their love into it. We also aim to put forward an image of the South Bronx as defined by long-term residents, as a strong and positive counterpoint to the image of the “Piano District” being pushed by real estate developers. “South Bronx Love Letter: Part 3″ is produced with support from the New York Restoration Project, and is presented in association with The Laundromat Project‘s Field Day in Hunts Point and Longwood. The Laundromat Project’s 5th Annual Field Day Festival of Neighborhoods serves as a moment to highlight and amplify the resiliency of our shared communities. 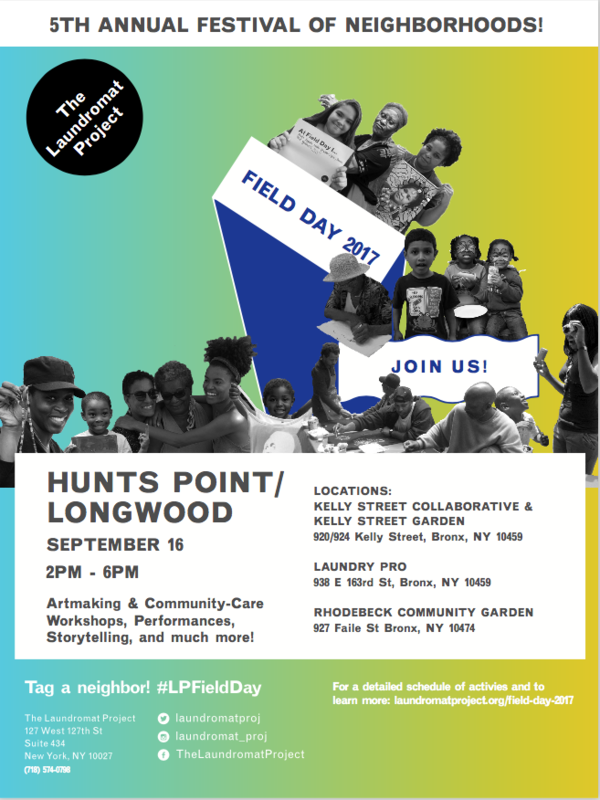 Field Day will include day long community-centered celebrations of solidarity, self-care, love, and joy in Hunts Point/Longwood (Sept 16th), Bedford-Stuyvesant (Sept 23rd), and Harlem (Sept 30th). Each day The LP will feature public art projects, community art workshops, creative walks, and much more. Activities are facilitated and led by The LP’s current and alumni artist cohort, community members, and community partners. 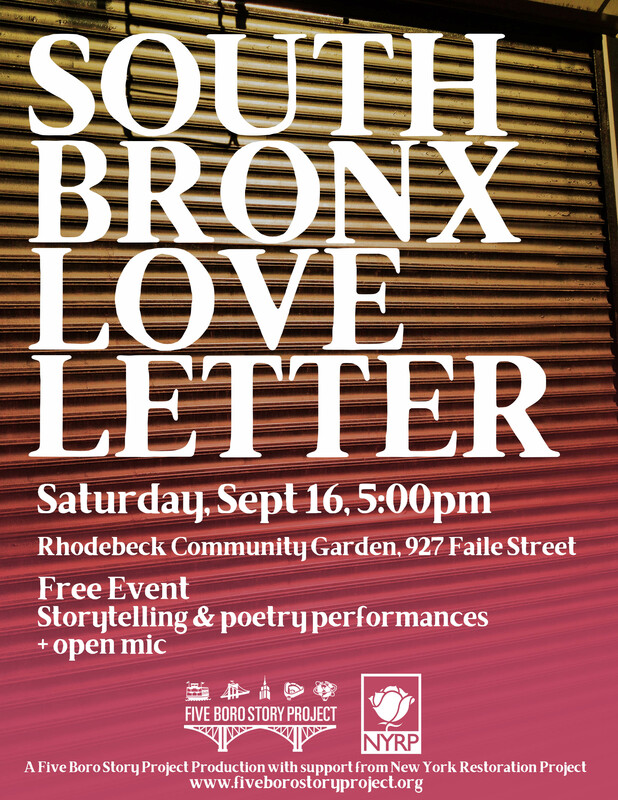 View photos from “South Bronx Love Letter” HERE.